[Image: The "Throwable Panoramic Ball Camera" by Jonas Pfeil]. The "Throwable Panoramic Ball Camera," designed by Jonas Pfeil as part of his thesis project at the Technical University of Berlin, creates spherical panoramas after being thrown into the air. Our camera uses 36 fixed-focus 2 megapixel mobile phone camera modules. 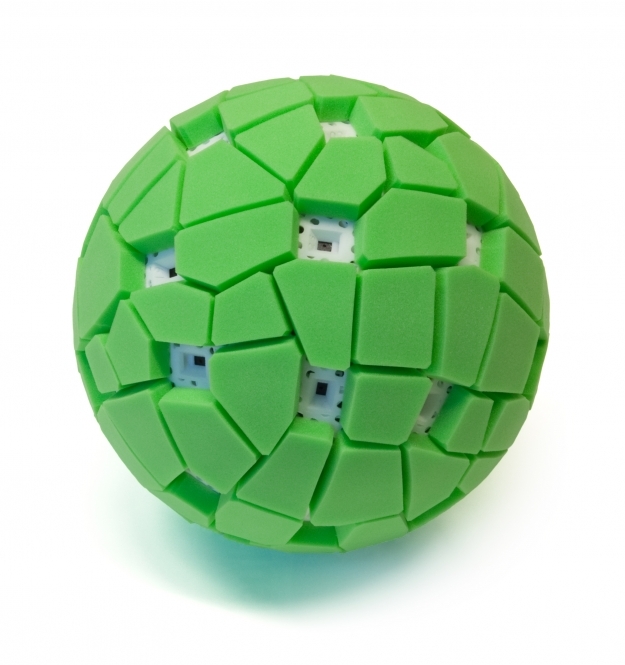 The camera modules are mounted in a robust, 3D-printed, ball-shaped enclosure that is padded with foam and handles just like a ball. Our camera contains an accelerometer which we use to measure launch acceleration. Integration lets us predict rise time to the highest point, where we trigger the exposure. After catching the ball camera, pictures are downloaded in seconds using USB and automatically shown in our spherical panoramic viewer. This lets users interactively explore a full representation of the captured environment. It's easy enough to imagine such a thing being mass-produced and taken up by the Lomo crowd; but it seems equally likely that such a technology could be put to use aiding military operations in urbanized terrain, with otherwise disoriented squad leaders tossing "robust" optical grenades up above dividing walls and blocked streets to see what lies beyond. Either way, a throwable camera strong enough to withstand bad weather and strong bounces—and able to store hundreds of images—sounds like an amazing way to start documenting the urban landscape. In fact, the very idea that a "photograph" would thus correspond to a spherical sampling of all the objects and events in a given area adds an intriguing spatial dimension to the act of creating images. It's a kind of reverse-firework: rather than release light into the sky, it steals traces of the light it finds there. This is very cool. I can certainly imagine it becoming a big hit with the general public, but I don't see why the military would use it when they already have hand-held micro-drones at their disposal. Would be very useful for photogrammetry as well. Toss the ball up in a few places, feed the photos into some software, extract the 3d terrain data. When marketed to the general public, what do you suppose the cost will be? It reminds me of a technique used by kite aerial photographers: you take one fisheye image straight down with the camera on the kite. On the ground you take an other one straight up. Now you can virtually navigate inside the bubble. I am only being mildly flippant when I say that I think this has potential applications for GoogleStreetView. In the future you won't see the vans, instead you'll see stoned-looking dweebs throwing their padded green balls in the air. Wow! What an innovative device! This would be a great tool on a site visit. I can see a lot of potential (as suggested above) in taking it a step farther to combine images to create an accurate 3D model of a place. That would be a real stride forward in 3D modeling (and 'virtual tourism'). Can't wait to buy one! What happens if you don't catch it? Seems like something like this will break before too long. REally clever idea obviously, I especially like that it takes the photo at 0 acceleration, being the highest point. Very clever.